It is Monday, June 23rd, dodging rainstorms. I wish I could report that I am working on my old cars, but alas, I have been spending the past two weeks repairing and building new board fencing. What a job. But Greg has a report for us about his working on old cars. 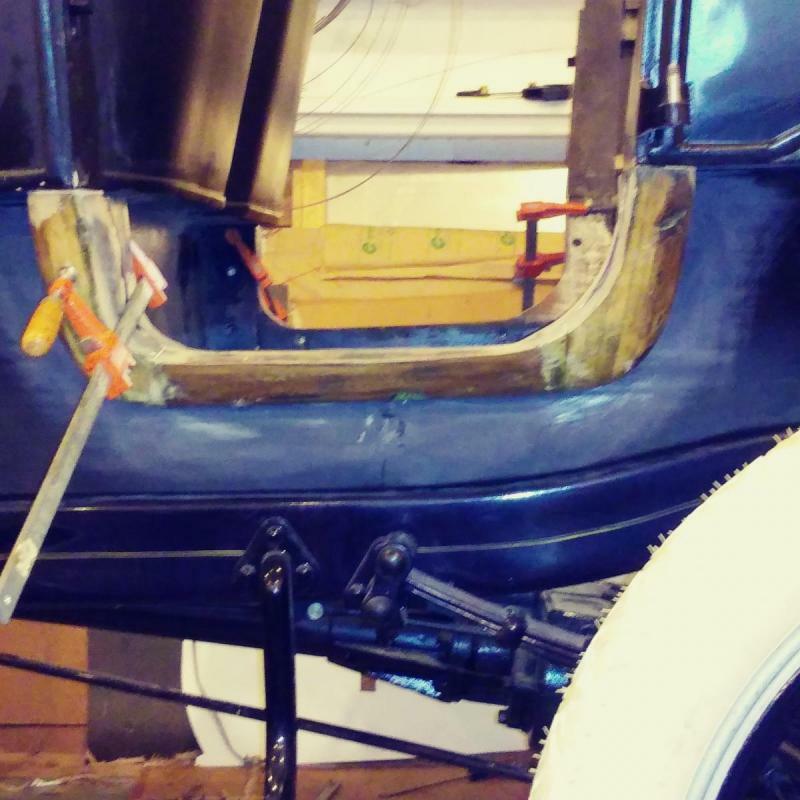 We're pushing ahead on disassembly of the Model T'ree. The engine is out and mounted on the stand. 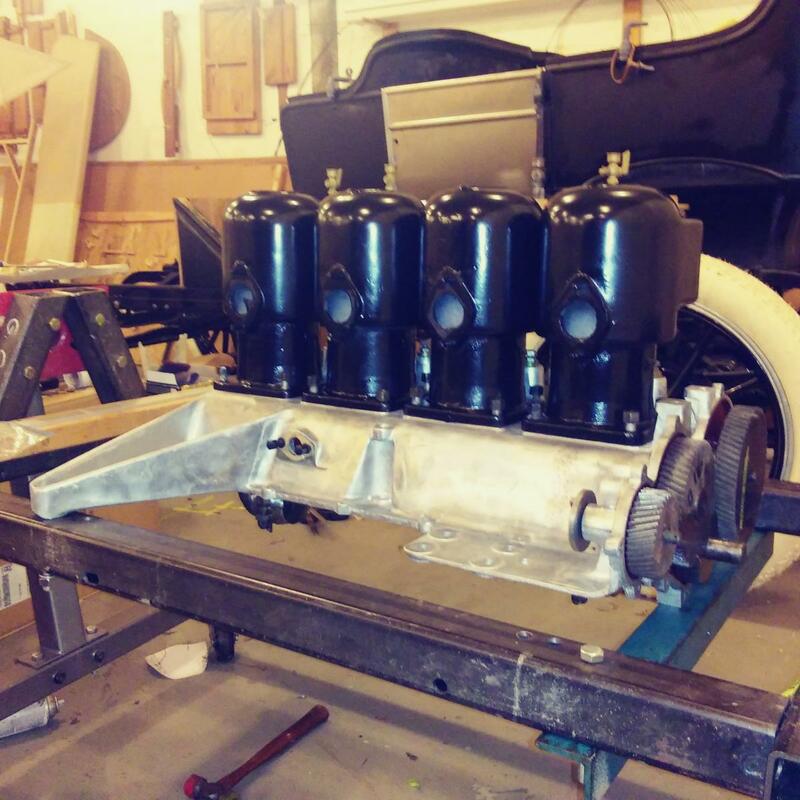 Over the weekend Nate and I were able to remove the transmission cover (codeword "hogshead" for you non Model T guys) and also get the oil pan off to expose the engine's innards. Surprisingly, after all those years of outdoor living, the internals don't look too bad. 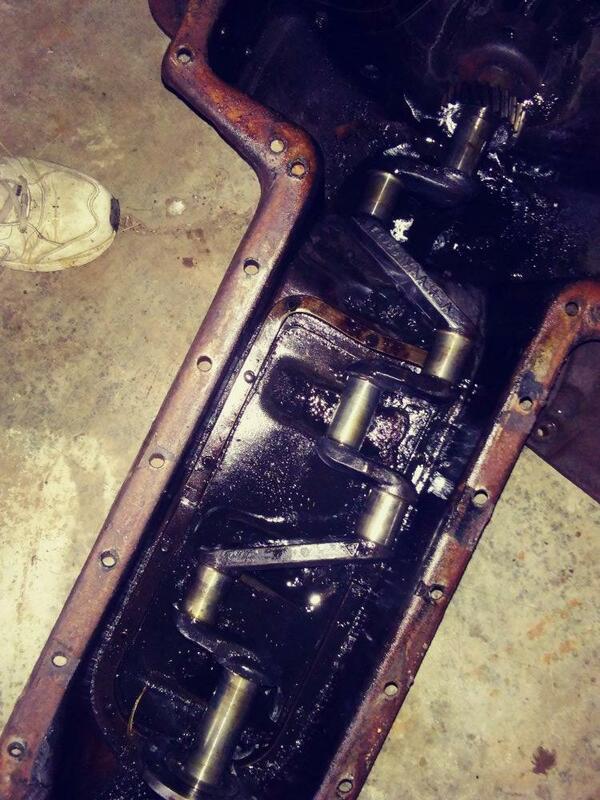 The pistons are stuck in their bores so removal of the flywheel and attached transmission may have to wait until we invert the engine to remove the connecting rod and main bearing caps to free the crankshaft and transmission as a unit. 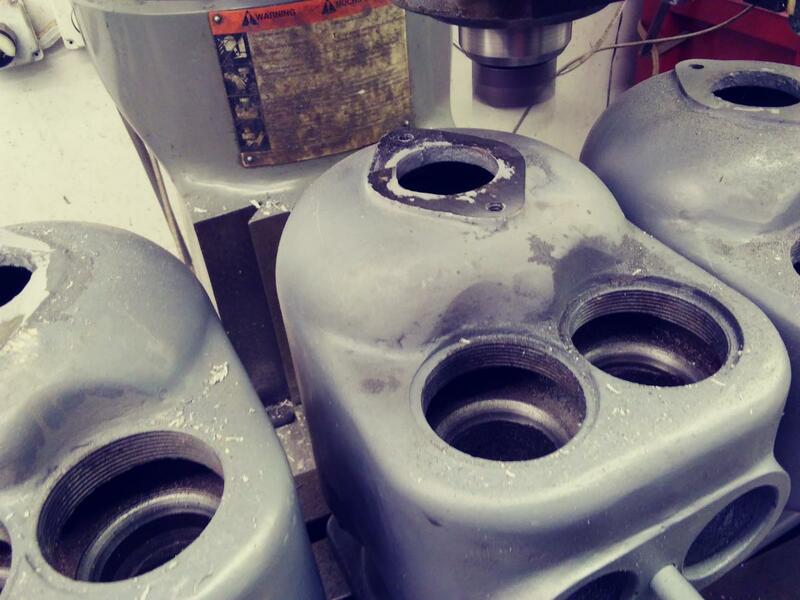 Then we can free up the pistons and rods. All in all, it looks to have been well sealed from the elements and seems to be a good candidate for overhaul....so far. We also found that because this chassis had been converted to a power unit that all of the infamous transmission bands had been removed, low, reverse and braking were unnecessary. Looking forward to the next episode which will happen when Nathan has more free time. I've been off the air for quite a while. Computer issues have prevented me from posting photos. I'm now venturing into this modern era by retiring my flip phone to explore the point, shoot, email scene with my own internet capable "device". I'll sent this message to myself to see if the photo makes it . Old dog, new tricks. Here is another little tidbit from Greg. Maybe David (trimacar) will post a pic of the mentioned Buick for us to see. And perhaps a little bit of its history in his care. Maybe you can see that I'm trying to catch up with old news. I've had some machine work for David Coco's Model 16 Buick shelved for months and/or years. 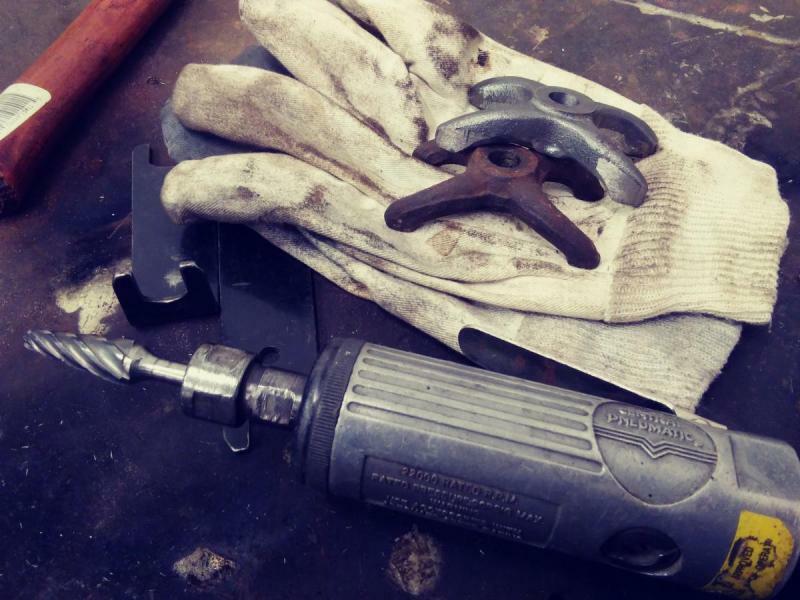 The pictured is a reproduction engine cylinder retention clamp that needed a bit of work to resemble the original clamps. Clumsy to capture in the milling machine, I did get away with gentle cuts, the rest of the material removal required some artistry with a die grinder. Sometimes you just have to just get after things. 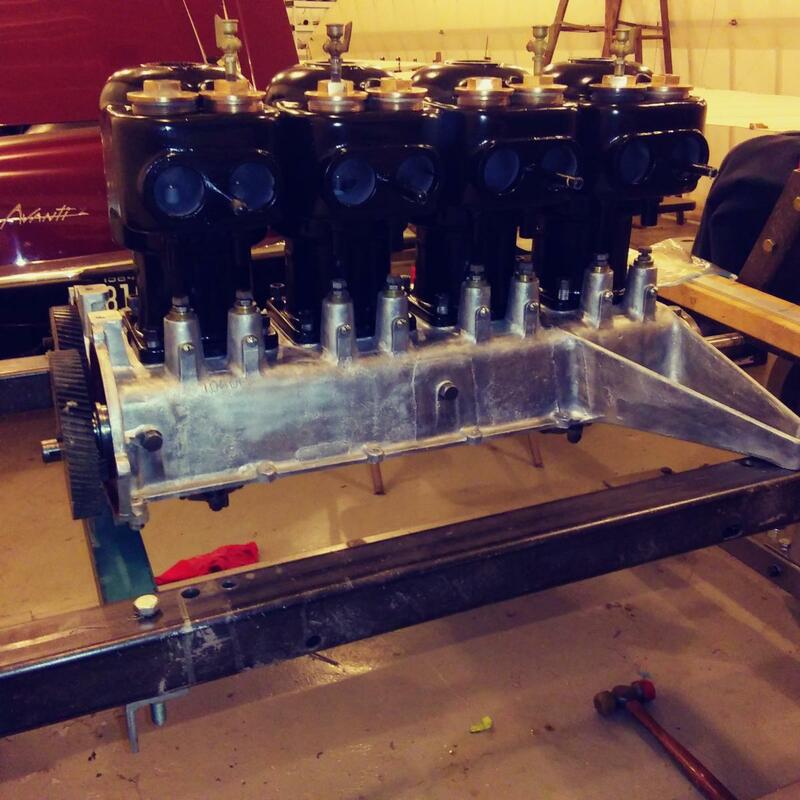 It is Thursday, July 26th; and as luck would have it, we have a report from Greg and Nate on the Model T engine. We continue to disassemble Nate's T Model engine. Some things stubborn from years in the outdoors, but it is coming apart. 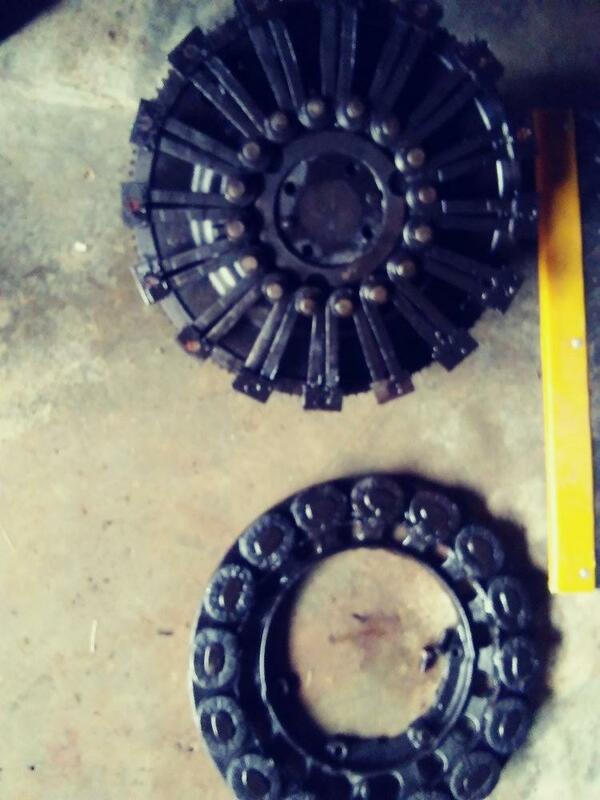 It was supposed that since the pistons were stuck in the bores and that would discourage the removal of the flywheel and transmission from the crank, that we could remove the bearing caps and sneak the assembly through the magneto coil ring, but due to close tolerances that didn't work out. 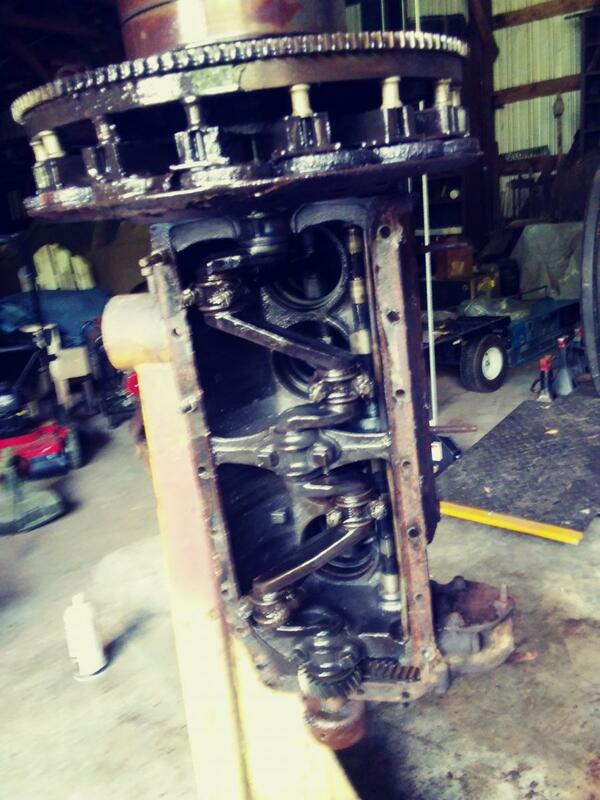 However, out of desperation we were able to take an old Dodge Brothers axle shaft and persuade the pistons to come on out. Then we could rotate the crank, remove more hardware and take it down the old fashioned way. Things are still looking pretty good in there. 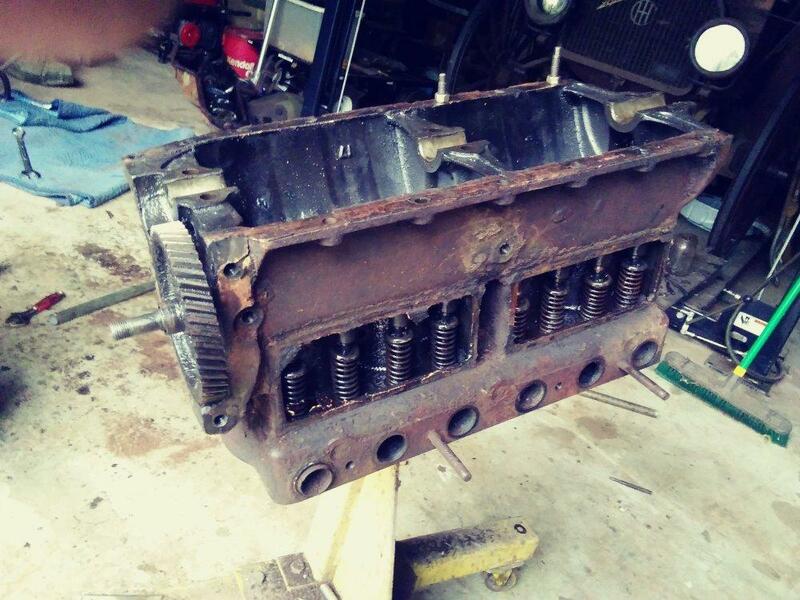 Next task is to free up and remove the valve components to allow the camshaft to come out. It is Saturday, July 28th. Headed to cars and coffee this morning. Most were modern era cars to include Alice in the Tesla and me in the BMW Z4. Here are some of the cars attending. That Porsche 944 Turbo would be a nice car to own. The green one tucked away in the corner, I can't tell if the orange one outside is a 944. John? Long time no hear from....how's it going? Chris, just busy with the farm, still working on the fencing. Had to stop and have Dan repair the post hole auger. I had worn out the tip, which is replaceable. So bought a new tip and handed it off to Dan to replace as I could not get it to budge. Camaro Steve happened to be at Dan's shop, and they struggled for over an hour to get the old tip off. Steve said they heated it cherry red and had to use a huge pipe wrench and extension to get it off. Now it is ready to drill more holes. Cars and Coffee tomorrow so decided to wake up the 1928 Buick and take it. It has been sitting since last October so had to check everything before starting. Oh no, turned on the fuel and it is pouring out of the sediment filter. I know I can make a new cork gasket, but the metal/brass screen was all distorted. So decided to head to Tractor Supply to see if they had any gaskets that might be a good substitute. Well, they had an exact fit for $3.50. Put in the new screen and gasket and no leaks. The engine fired right up. Will do a cleaning today and head off to the event tomorrow. 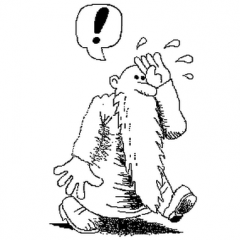 It is Saturday morning, and as luck would have it, we have a report from Greg. Enclosed photos of actual progress on the Overland. Since my time this Summer has been consumed with other things, I'd sent them out for touchup of the bores, new valves, dressing of the seats and guide liners. Now that they have returned I took a few minutes last night to address the erosion around the upper water manifold port flanges. I also took the opportunity to mill them all to the same height, which they weren't. 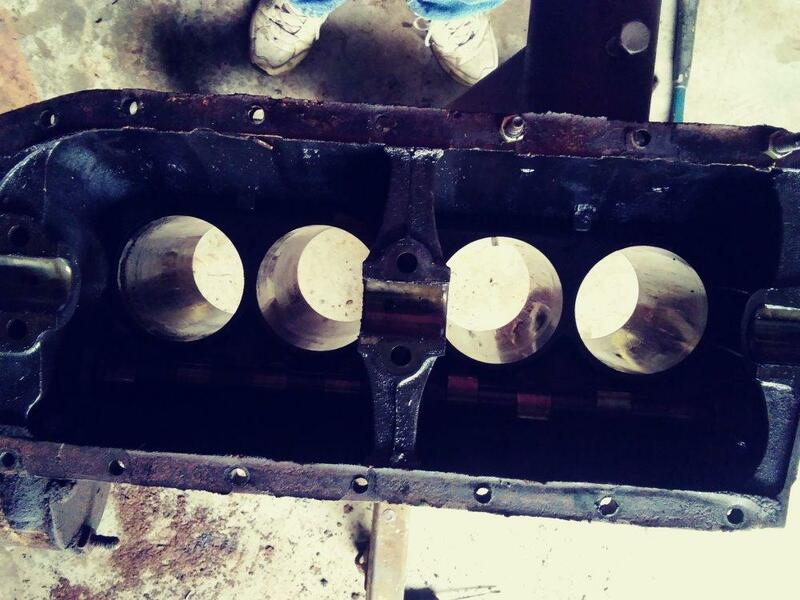 The next operation will be to dress those seats around the valve cap ports for proper sealing of the copper gaskets. A very busy week ahead, so I can't promise when that will happen. I had a great time at the C&C event yesterday. 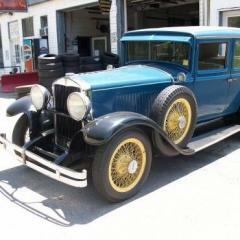 The 1928 Buick ran great for the 20 mile trip. Lots of nice cars. The AC Bristol was exceptional. Here are the pics of what I saw. It is Monday, Labor Day in the USA, September 3rd. Resumed putting up fencing now that the post hole digger is back in operation. Farm chores are never ending. We have been using Bownie the 1979 Chevy Van a lot. Yesterday, we came home with a very soft brake pedal, and a very bright "brake" light on the instrument cluster. Looks to be a failing brake mastery cylinder at first, but later on I found a rusted out rear brake line. So I ordered a new master for $30 and pre-formed lines and new clips from LMC Truck for $60. It will be a week or so before I get the parts and get the old van back on the road. Unless you have replaced those brake lines before, I would day that with Brownie being almost 40 years old, and you driving her on the salty winter roads on the east coast, I would say you have beat the odds with those brake lines. Joe, the winters are very hard on cars during the winter, the cold and salt mixture on the roads eats everything away sooner than later. Sure glad that parts are available and cheap for the old van. Just trying to keep her on the road. And speaking of old iron, Greg has an Overland engine report for us. Been a busy summer with not a lot of time for car stuff. The most important to do was witnessing the marriage of our youngest son Logan which took place last weekend in Chicago. Now that we're back and settling into the routine, I snuck in some time on the old Overland. With the machine work completed with the help of Dave Coleman, tonight I taped them off and dusted on a coat of epoxy primer. Later this week I'll apply a light coat of urethane black . Not trying for a Pebble Beach Glaized Ham look, but maybe a good day at the Toledo plant. 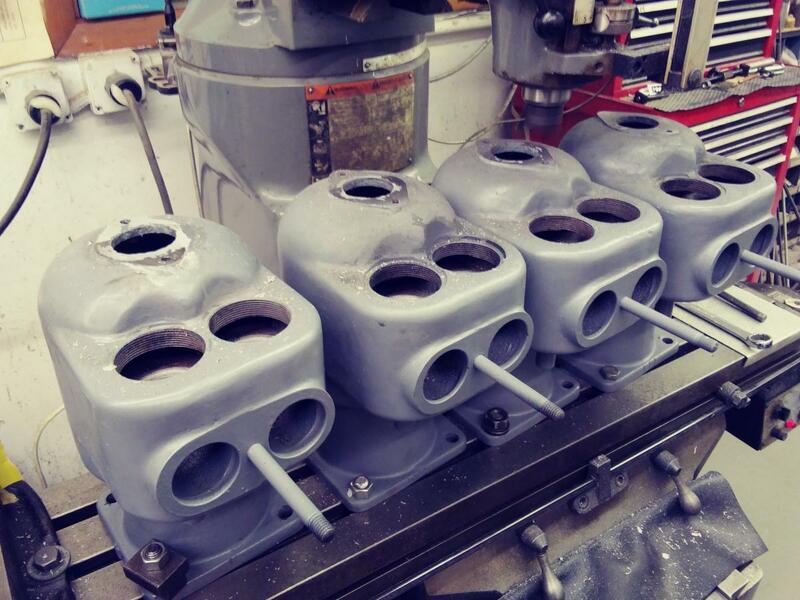 When cured they'll be ready for pistons, rings and valves. It's been years coming together but it will. Just returned from a week long trip to Seattle, WA. Lots of car parts waiting in boxes for me. It was like Christmas. First up on the lift is Brownie the van. Took off the crusty rear brake lines and will fit the new lines and master cylinder over the next couple of days. I take the modern BMW to the dealer for a safety recall tomorrow. They will be replacing a PVC heater that is prone to overheating and causing an engine fire. It will be an all day ordeal. Friday, September 28th. Just got a very short Greg report. Overland work, while the cylinders are being prepared for enamel topcoats, I've returned to the carriage and body trade. The lower door moldings have been installed with screws and epoxy. When cured comes the cosmetic work of adjusting the door gaps and filling the seams. Today is Wednesday, October 3rd. And we have a Greg report. Reward of Restoration. Take this for example, the Overland engine project. Hours of work. Taking stubborn or fragile things apart for cleaning and inspection. 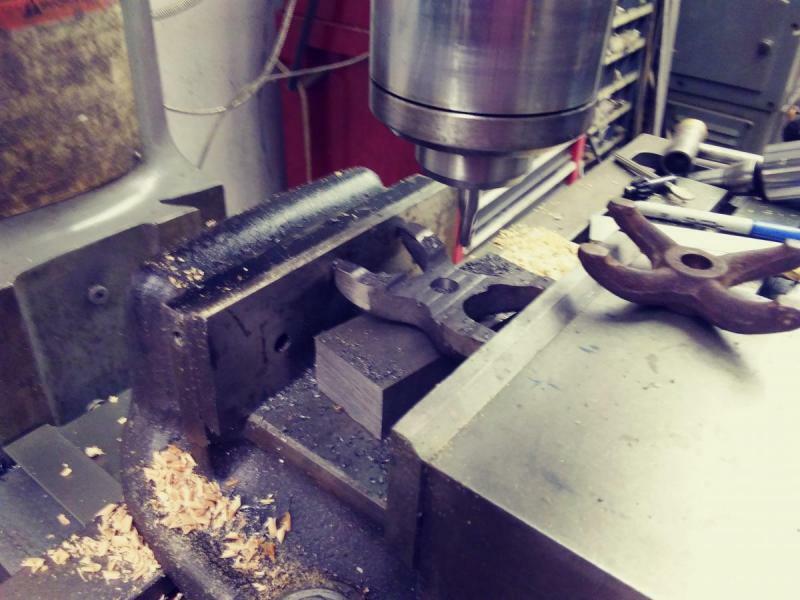 Trips to the machine shop to have the crankshaft magnafluxed and reground/polished. 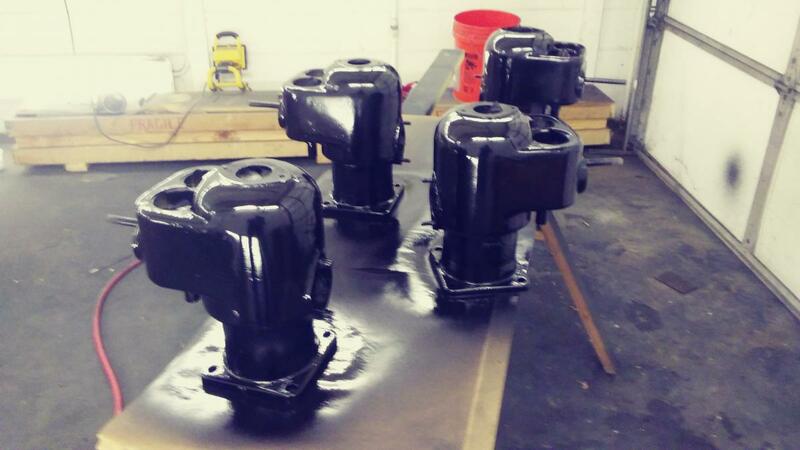 Scrubbing and surface preparation of the crankcase. Sending the camshaft out for regrinding and the costs involved. Major reworking of the cam followers , guides, adjusters and tappets and costs involved. Machining main bearing inserts, babbitting, line boring labor and costs, cylinder cleaning, bore honing, valve guide repair with inserts, valve seats refaced and set up for new replacement valves, Pistons cleaned, new wrist pins altered and fitted, fitting piston rings, connecting rods cleaned, shot peened, rebabbitted and machined and balanced along with crankshaft, (and costs involved) and that's just what comes to mind. 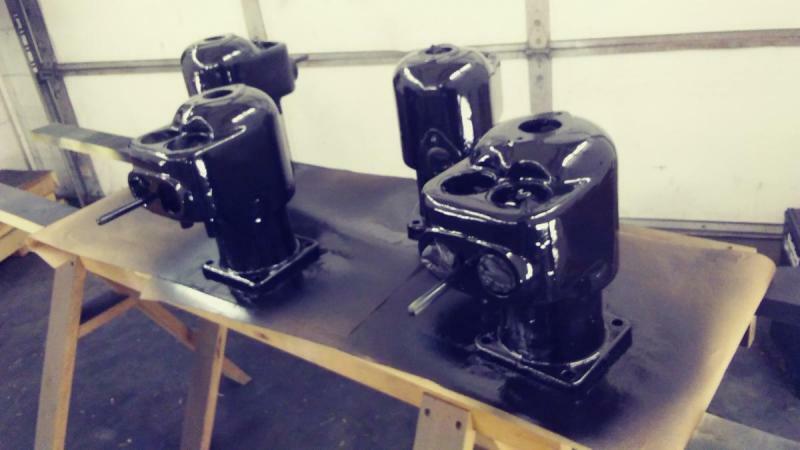 Cylinders painted. Then when you finally get this much assembled into one lump, you stand back, survey your efforts and say to yourself..."All that for this?!" But as my friend Mitch says..."At least we aint' hurtin' anybody." While Greg is busy with the Overland, I am still working on Brownie the 79 Chevy van. I got the new brake line from Dan and it fit almost perfect. I was able to put in some extra bends in the factory made part to get to somewhat fit. May not be perfect, but it will do for a farm vehicle. I then put on the new master cylinder after bench bleeding it, and then bled the entire system. Everything looks good and no leaks. Today I am going to check the brake shoes on the rear and pads on the front, before I call "victory". Friday, October 5th. Brownie the van is fixed, except for a test drive. The rear brake shoes have a lot of meat on them and everything looks good. Off to Hershey, PA next Wednesday, Thursday and Friday. Not taking up a car this year. It is Wednesday, Oct 10th and Joe and I are at Hershey for three day looking for old car parts. Lots of old cars, parts and people today. And it was hot, over 83 degrees. Thank goodness for the cloud cover so we did not cook all day. Here are some of the cars we saw. Most were overpriced as per usual on the first day. Rain expected tomorrow, no biggie. Fiat 600! Yay! ? That brings back memories. My first car experience. Ours was yellow with matt black roof. Dad overhauled the engine. It kept pulling rocker studs out of the alloy head so Dad fitted Helicoils. I drove it to school and as a Prefect I parked it on the school grounds. One day the boys picked it up and turned it into a corner so I couldn't get out. Independent suspension meant it handled better than a Morris Minor (which my school mates had) so I could keep up with them taking short cuts across petrol station forecourts and down alleyways. You were right across the street from us when you took the pictures of that barn find 29? Studebaker. Wish I would have seen you. A Fiat 600 was my very first car. Best car ever, lots of fun!!! Thursday, October 11th. It was a washout. Rained hard and harder all day. Only about 10% of the vendors were open and very few attendees. We did go over to the RM Auction previews to look at the cars to be auctioned. Some really nice cars. Here are just some of what we saw. I really lusted after the 1941 Lincoln Continental. That Austin Healey 3000 is a nice color. Would like to see that color on my Avanti. It is Friday, October 18th. 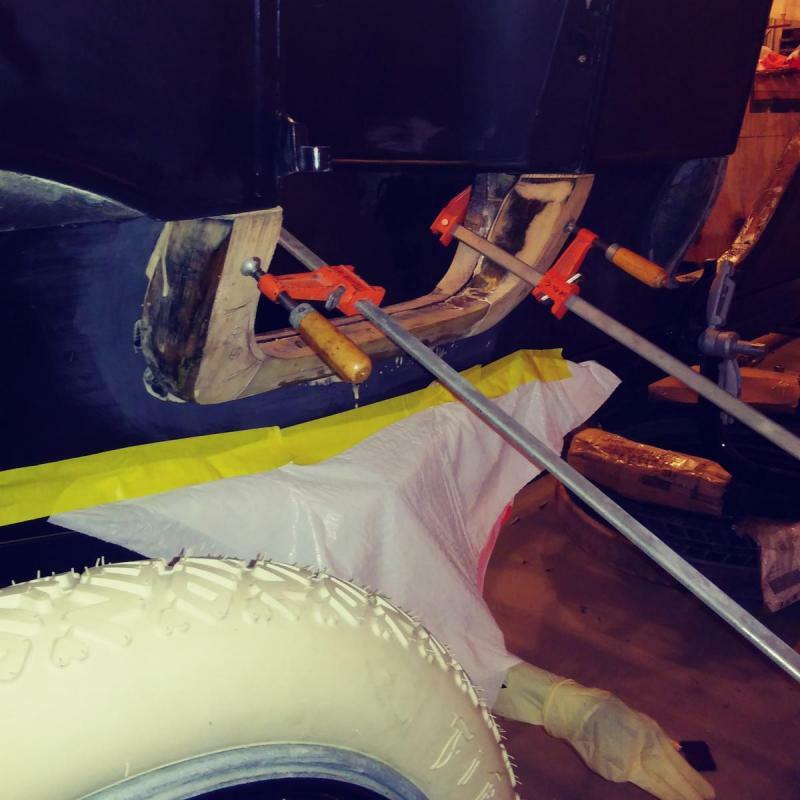 Joe (packick on this forum) spent the day taking off the front steel bumper and plastic panels from the Suburban. Lots of bolts to take off, but got off the bumper. Tomorrow we are going to replace the power steering cooler and then attempt to put on the new bumper. It was a challenge to put on the plastic top, it did not fit very well, but we got it on. Here are the pics of today's work. Everything was sure rusty.